Psycho is NextGen Gaming’s latest video slot, and it is based on the hit Alfred Hitchcock movie of the same name. The 60s classic is very accurately represented in this slot, which contains some of the most memorable moments from the movie, and uses them as special features in the game. Psycho is a long awaited slot, and it has not disappointed since its 2015 release. The slot was, of course, developed in partnership with Universal, so everything is as it should be. Players are going to find that a total of 25 lines sit upon the 5 reels of this slot, which features the infamous Bates Model as its backdrop. You will be able to adjust coin sizes from 1p up to £2, and that in turn will adjust your wager. Only one coin per line can be bet, and the paylines are fixed. Players are going to be wagering anything from 25p up to £50 a spin on this slot. Several iconic symbols are used from the movie in this game, as are the high playing cards. The letter, which run from 10s to Aces can see players pocket anything from 5 coins up to 150 coins per win. 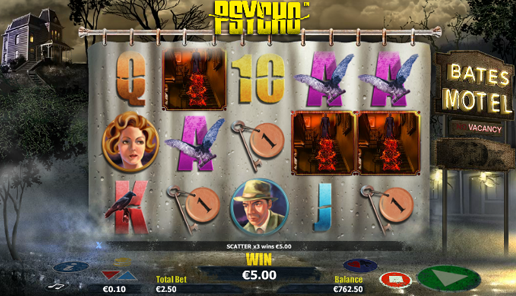 The symbolic imagery such as the motel keys, peeping eyes, Mr Bates and the unfortunate shower girl are all top paying symbols, with wins varying from 10 coins up to 1,000 coins. A wild symbol is present in Psycho. It can reward players with a win of up to 1,250 coins, if 5 appear on any payline. The wild can also replace all other symbols in the game, except the scatter icon. Wins with wilds may be multiplied by up to 20x their normal rate of pay. 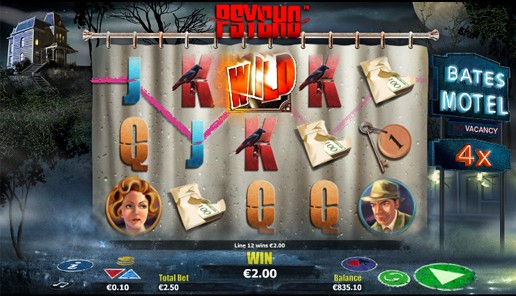 The Bates Motel also acts as this slot’s scatter icon. When it appears 2, 3, 4 or 5 times, it will award wins of 25, 50, 375 or 2,500 coins, the latter being the non-progressive jackpot in this slot. Landing 3 or more scatters will also offer the player a free spins bonus. 3, 4 or 5 scatters will offer the player 10, 15 or 20 free games, respectively. During the free games bonus, Bates may get knife-happy, and start slashing wilds onto the reels, offering up wilds and wild multipliers. The infamous shower scene may also see Bates slicing and dicing wild symbols onto the reels. The thrills and spills of these features can result in some pretty sizeable wins. 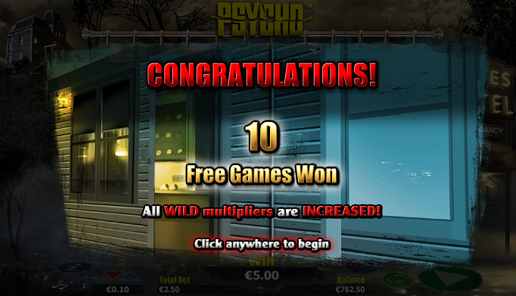 Psycho has been released to acclaim and can be found at all good online casino sites which offer NextGen Gaming titles. The slot has several really engaging and entertaining special features, which make it quite appealing to a wide variety of players. Of course, lovers of the original film (or even the so-so 1998 remake) will find Psycho the most alluring. The slot is cheap enough and has quality enough upon its reels to prove a real delight to the online slot world.